Time really does fly. It seems like just yesterday we were handed the keys to our long-term Suzuki V-Strom 1000, but in reality, it was almost half a year ago. Fortunately, that has afforded us ample time on this new machine, using it on rides big and small to get to know how it truly measures up. Although the stock bike we received in June was nicely appointed and ready to rumble as we rolled it out the doors of Suzuki USA’s HQ, we felt it needed a handful of subtle modifications to genuinely prepare it for the adventures we had in mind. Before we installed the first farkle, we did have a defined plan in place. 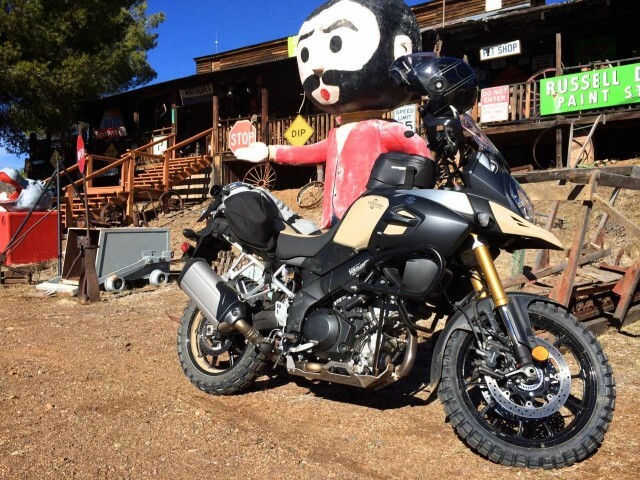 Because the highly revamped 2014 V-Strom entered the market hoping to hang its hat on the value hook, it seemed inappropriate to then slather the poor thing in thousands of dollars worth of add-ons. In keeping the modifications modest, we were also determined to make them as functional as possible. Starting with tires and protection, we went with a blend of factory and aftermarket parts. The after image with the tires and guards in place gives the bike the visual attributes it sorely needed. 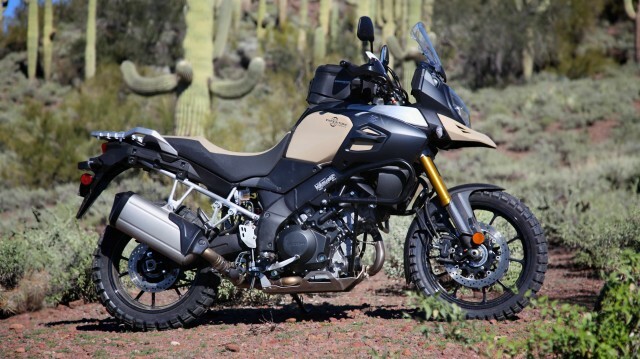 Bone stock at $12,000 the V-Strom is a great bike, but nowhere near ready for off-road riding of any kind. It’s safe to say a lot of factory crash bars seem to lack substance, but such cannot be said of Suzuki’s factory option. In fact, they might be a tad overdone, at least in sheer weight. They are heavy. If there’s anything to improve on other than the heft, it might be with the lack of coverage higher up on the tank where damage might prove to be most expensive. Early reports from within the industry’s press corp reported significant damage, even in modest tip-overs, and though not having done so ourselves, we can see how that could be very true. 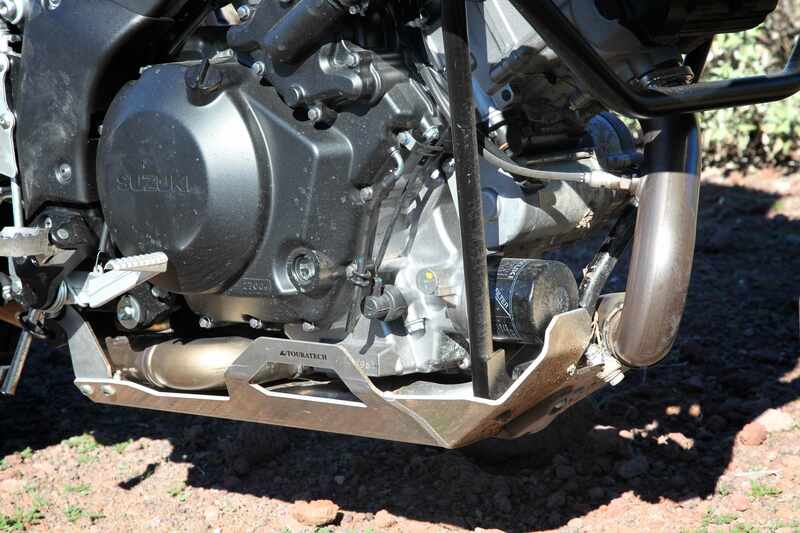 For lower protection of the engine we went with Touratech’s aluminum skid plate. Because the V-Strom’s oil filter hangs out in front of the engine like an Adam’s apple waiting for a karate chop, it simply had to be shielded before we went off-tarmac. If there is anything to be said of the skid plate, it would have to be with regard to its supremely snug fit. In an effort to not compromise ground clearance, the skid plate hugs the engine with minimal room to spare. Although it would take one spine shattering event to cause the skid plate to impact the engine, it does seem plausible. For that reason, I like to think of the skid plate as a guard against rock strikes. 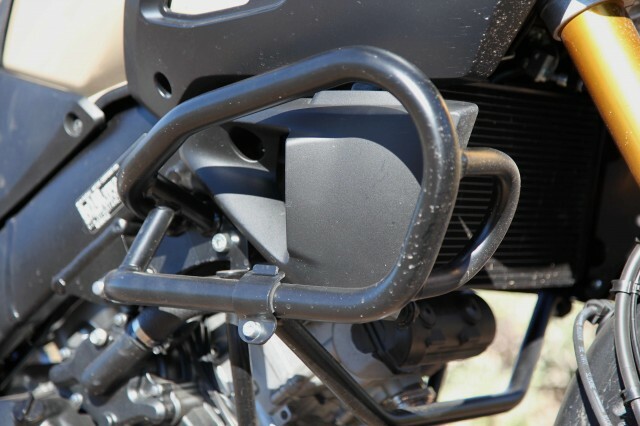 Even with the full coverage front fender, something that may have to be removed in the immediate future, we opted to install a small Touratech radiator guard to protect against stone damage. 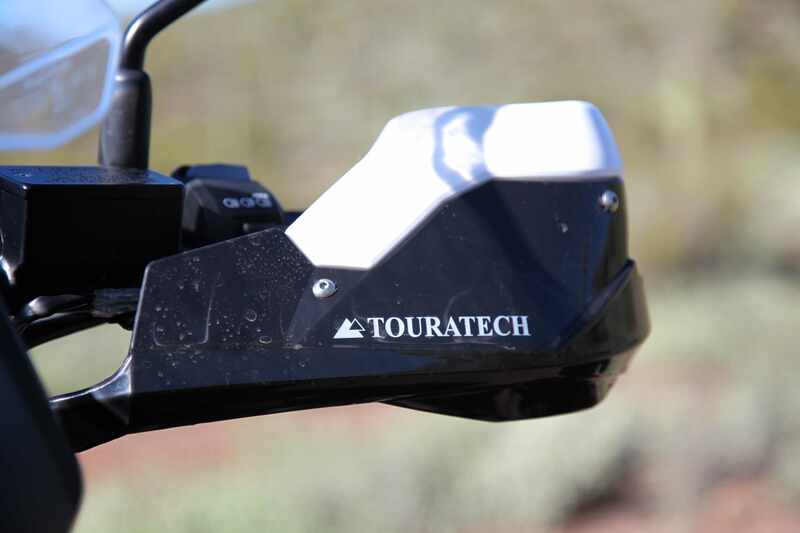 The only other protection we added was a pair of Touratech hand guards. It might be necessary to improve on the brawn of those guards with something more substantial. Other minor but important farkles included Touratech’s wider all-metal pegs and a locking GPS mount for our Garmin 660LM. Beyond that, we occasionally fit the bike with an Enduristan tank bag, as well as Kriega and Giant Loop soft luggage. If we add anything in the coming weeks, it might be a luggage rack for more gear fitment options and perhaps auxiliary lights for better visibility. 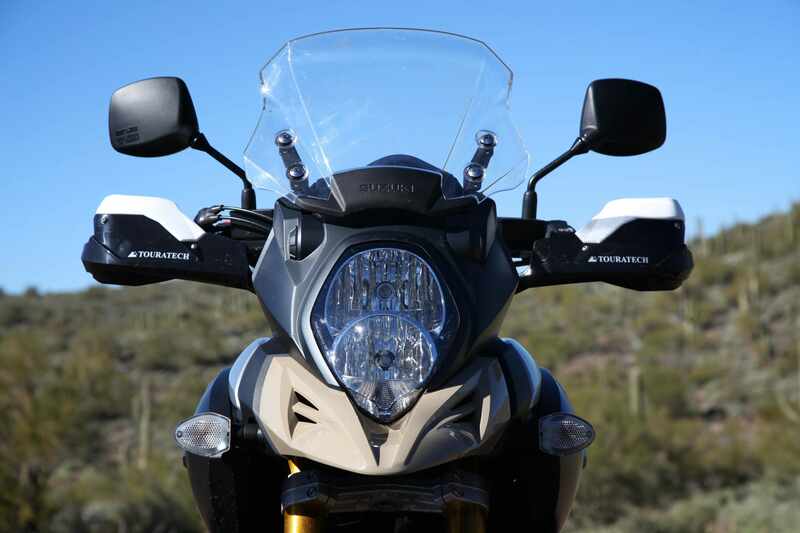 Shortly after receiving the V-Strom 1000, I set out to annotate my initial impressions with those thoughts documented in our first ride review. Six months on, I have to say many of those first impressions hold true. The new V-Strom is leagues ahead of its predecessor and a machine slowly closing the technical gap on bikes further up market. 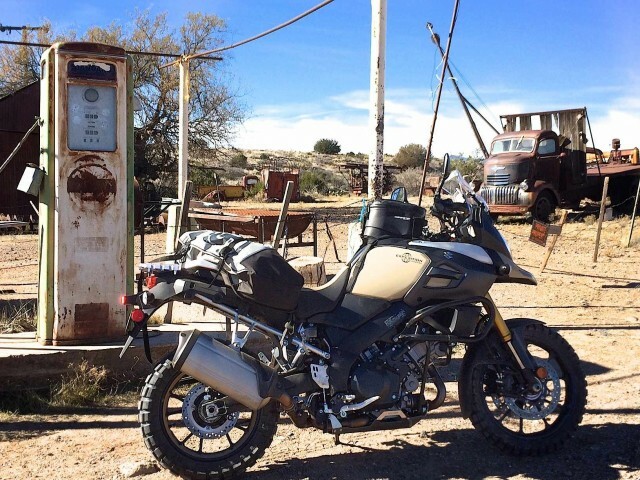 Is it a BMW R1200GS contender? Not by a mile, but it is far better than one might expect and priced $3,000 to $5,000 less than the upper echelon bikes on the market. Balance. 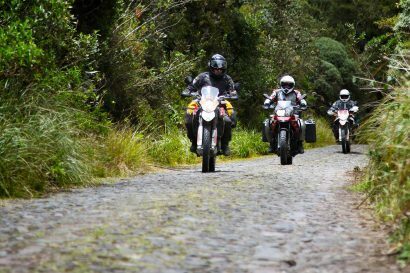 When exiting the road and venturing into the rocks, ruts, and ledges, the V-Strom does have excellent balance and poise. Moving the bike from side to side and finding a suitable sweet spot between the bars, pegs, and seat is easily achieved. Ergonomics will always be individually influenced, but they are neutral enough to accommodate most riders. The bars might be a touch narrow for some and I truly wish they had popped for oversized bars, if for no other reason than aesthetics. The OEM bars appear to be plucked from a kid’s bicycle. Power. Inevitably, someone is going to stick this bike with a witty barb and accuse it of being underpowered at just 99hp. 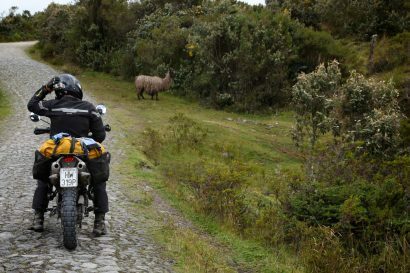 This has less to do with the V-Strom itself, but more a matter of developments outside of Suzuki, namely with the KTM 1190 and BMW R1200GS which now crank out massive ponies, likely more than anyone will ever need. In my opinion, the V-Strom 1000 scoots along just fine. Seat. It seems Suzuki really made an effort to do their best with seat comfort, even going so far as to fit the sides of the seat with a texturized material for added durability and grip. The step up to the pillion seat is well positioned, and even for 5-8 hour rides has been adequately comfortable. Wind Protection. There has been a little bit of differing of opinions on this score and it has everything to do with rider height and size. At a bit over 6 feet tall, I have a short torso and find the adjustable windscreen is just fine, whereas my taller cohorts have felt more head buffeting than they would prefer. 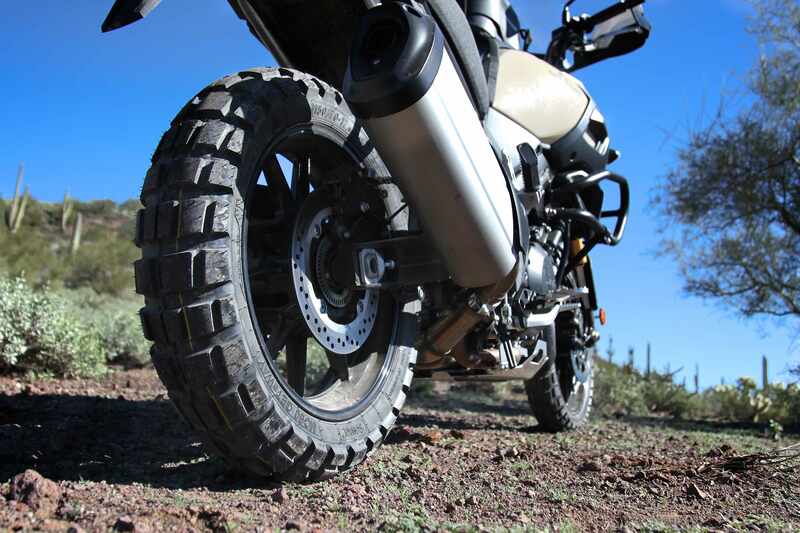 The 2014 V-Strom marks Suzuki’s first foray into Traction Control, and while it is a noble first effort, and might have hit the mark for paved saves, it really does struggle on the dirt. When throttling through bumps and chatter at speed, the TC seems confounded if not a tad violent. The whole experience is jerky, nervous, clanky, and at times wholly counter productive. At slower speeds in more technical terrain, the TC works no better and is best switched off, something easily achieved with the left thumb control. The non-switchable ABS is another niggle, although removal of a fuse under the seat can deactivate the system. I will say the ABS works much better than the TC in the dirt. Ground Clearance. At only 6.5-inches, the ground clearance isn’t terrible, but it is worthy of attention when entering troublesome terrain. 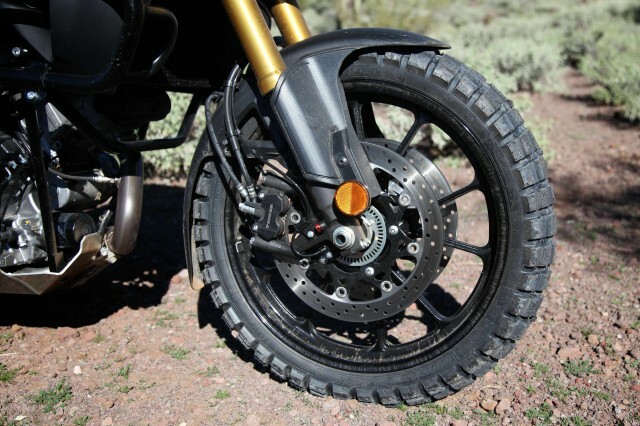 The 6.3-inches of suspension travel also makes forays into the dirt not impossible, but rider’s will have to keep a keen eye on line selection and ride with restraint. There’s not much there to overcome your poor judgment should you challenge terrain beyond the ‘Strom’s design parameters. It’s a minor grouse, but I do wish Suzuki had added cruise control to their new electronic throttle. I also find that throttle to be a bit twitchy, something that causes me to place unusual concentration on my off-road throttle management. Fuel efficiency has been favorable with our 6-month average at roughly 44 mpg. Some critics have lambasted the new engine for having lack luster top end performance. There is a significant fall-off of power at the upper reaches of the revs, but nothing that I would file in the fault column. 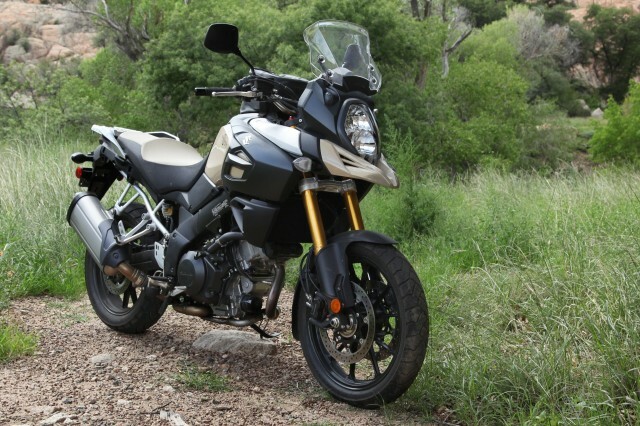 Overall, I tend to find the V-Strom as a superb on-road performer, but given a few minor shortcomings, won’t best the best of the bigger bikes in the dirt. Once off-road, it’s not bad by any stretch. 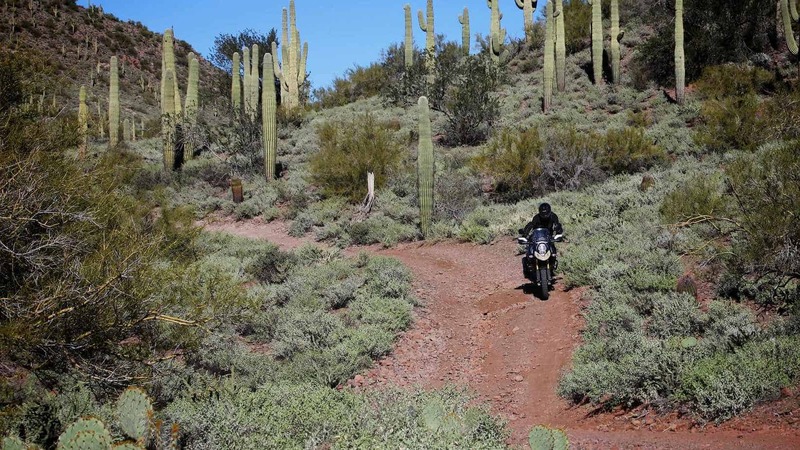 If your riding is primarily cordoned to gravel roads, mild off-road tracks, and other modest routes, the V-Strom will tackle those scenarios with confidence inspiring aptitude. Other reviews have made it sound as if only those with a death wish would even venture onto gravel, but I feel that’s complete hooey. Fortunately, we still have more time with the V-Strom 1000 and plan to put it to more ambitious endeavors. We’ll also hand it over to our in-house hooligan, Scott Brady, who has made it his hobby to find the upper limits of off-road motorcycle performance. Until then, I’m off on another ride atop this great machine. I have been riding motorcycles continuously since getting my license and a Honda Nitehawk in 1988. However the bulk of that time, like many riders, has been on good old pavement. 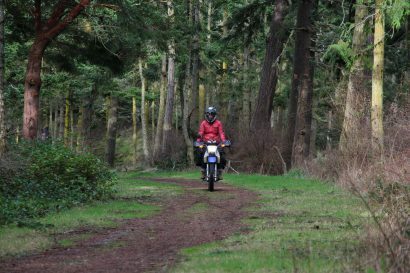 Although I have worked hard over the last few years to hone my off-road and “big bike” riding chops, I still consider myself in command of rather average adventure bike riding skills. 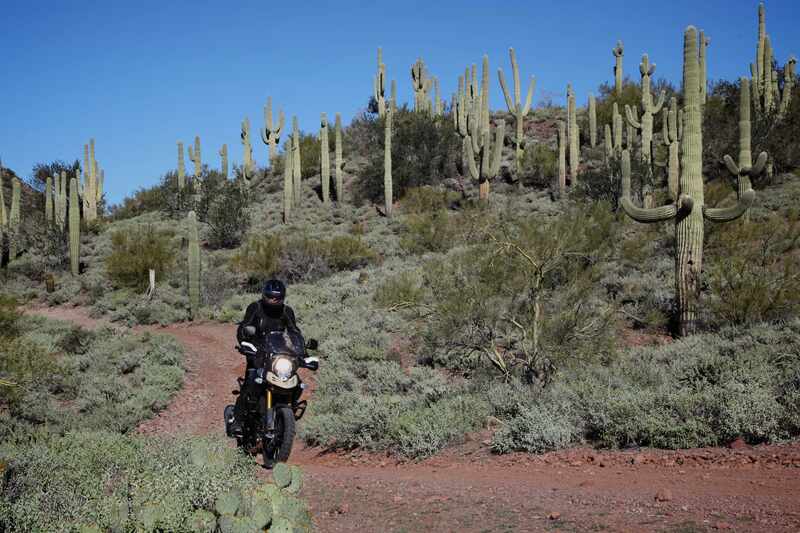 When evaluating adventure bikes, I feel my understanding of motorcycle technology and designed, paired to my riding skills of the every-man, keeps my opinions balanced and as objective as possible. There’s no bravado here. A humble rider’s opinions is what I strive to offer.